LOS ANGELES, CA — On Saturday, September 27 (10am-4:00pm), the Berry Hill neighborhood of Nashville will be the place to be if you have anything to do with professional audio, home recording or simply making music. 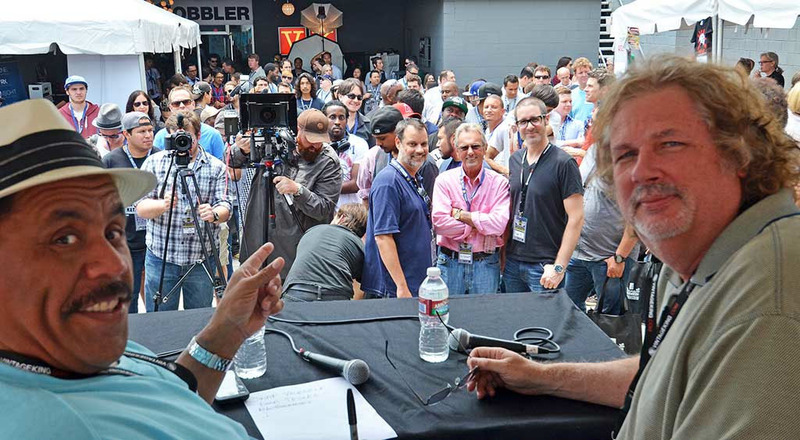 Gear Expo 2014 – a creation of Pensado’s Place, the acclaimed weekly educational web series, in conjunction with Vintage King Audio, a leader in professional audio sales, studio consulting, and comprehensive gear servicing – is the second annual event, affectionately known as “Nashville’s Pro Audio Block Party.” Simply put, Gear Expo 2014 is one of the biggest gear and music-making expos in America. Attendees will once again be able to demo gear, talk directly with manufacturer reps, watch live interviews, mingle with celebrity guests, ride the Gear Expo tour bus, win prizes, enjoy local food trucks and meet Dave Pensado and Herb Trawick of Pensado's Place. The official “Pensado/Vintage King Gear Expo Tour Bus” will be taking visitors back and forth to the legendary Blackbird Studio all day long. As one of Vintage King's biggest supporters, Blackbird has hosted historic sessions with artists such as Neil Young, the White Stripes, Bruce Springsteen and more. Giving guests another opportunity to check out new and vintage gear hard at work, partygoers will be able to see John and Martina McBride's studio in all its glory.